Composed by Paul SanGregory. 21st Century. 32 pages. Published by Distant Engraver Music (S0.367643). These imaginative pieces are quasi-poetic musings that develop various colors, moods and atmospheres. 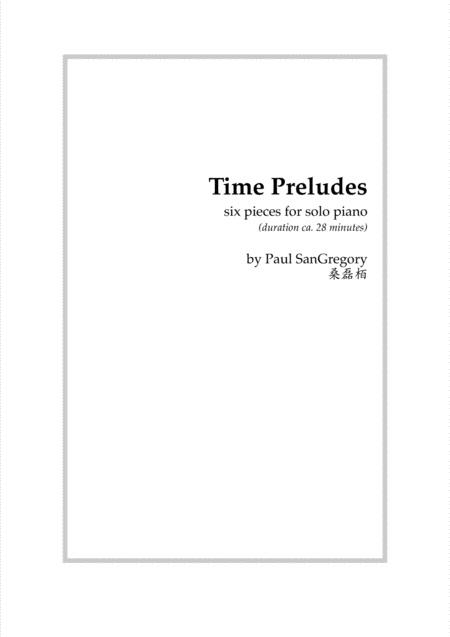 They are called "time" preludes because each one focuses on a different way of handling the progress of musical time. For example, some contrast different lengths of note groupings while maintaining a consistent tempo, while others rely on changing tempos, on the use of accelerating and decelerating figures, or on the use of much "rubato". The result is that they flow naturally, without the rigidity or predictability of traditional meters, while their imagery inspires pianists and audience members to let their imaginations roam. These preludes may be performed separately, in small groups, or as a complete set as needed. Because certain preludes allow for much freedom of tempo, exact timings may vary from performance to performance.